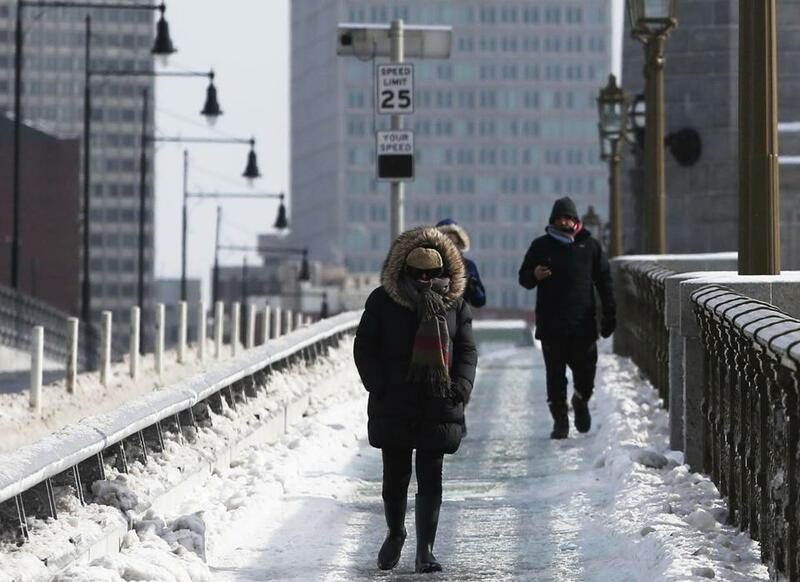 The Longfellow Bridge in Boston was an arctic scene Monday. With Arctic air pouring into the region, windchills are expected to drop temperatures to between minus-10 and minus-25 in Greater Boston. The windchills could cause frostbite on any exposed skin in as little as 30 minutes, the National Weather Service said. Worcester tied for a record low temperature for the day early Monday morning, falling to minus-6. The record had been set in 1970. Worcester also saw windchills as low as minus-30, according to the National Weather Service. In Boston, a high of just 10 degrees Monday set a new record for Jan. 21, besting 12 degrees set back in 1985, the weather service said. Providence and Hartford also set record low high temperatures with minus 5 degrees and 4 degrees respectively. The previous records, all set in 1985, were 8 degrees in Worcester, 7 degrees in Providence, and 8 degrees in Hartford, according to the weather service. The MBTA is urging customers to allow for 10 to 15 minutes of additional travel time to their Tuesday morning commutes due to extreme cold, winds, and icy conditions. Boston could still break its record of zero set back in 1888, according to meterologist Alan Dunham of the National Weather Service in Norton. The extreme cold also contributed to flight cancellations and delays at Logan International Airport. As of 8 p.m., there were 441 delays and 373 cancelled flights, according to flightaware.com. 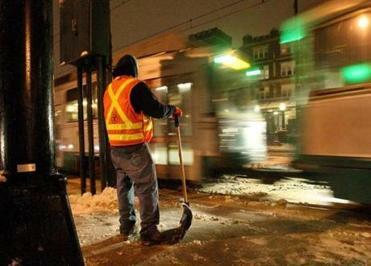 There were no service issues on the MBTA due to the cold weather, said spokesman Joe Pesaturo. The agency has advised riders to plan ahead 10 to 15 minutes for the Tuesday morning commute, due to the ice and cold. By 8:30 p.m. Monday, there were 1,388 power outages across the state, according to the state emergency management agency. Shelters in Boston are working overtime to bring homeless people indoors for at least one night. “In this kind of weather, we can sometimes coax those who stay outside to come indoors,” Barbara Trevisan, a spokeswoman for Pine Street Inn, said in an e-mail. Pine Street’s four shelters have been “open around the clock and we are urging people to stay inside,” she said. “We staff up and do not turn away anyone in the cold, and will accommodate everyone at our shelters or transport people to other shelters if they have space,” Trevisan said. “Our goal is to ensure that no one dies in the cold,” she said. Boston officials have urged anyone who sees someone outside and looking disoriented or distressed to dial 911. “The goal is to ensure the safety and well-being of vulnerable homeless persons,” the city said on its website dedicated to resources for the homeless during the cold weather. “During winter storms or any time the temperature falls below freezing, a network of city agencies, homeless shelters, street outreach and other community partners mobilizes to provide resources and services to help the homeless in winter,” Samantha Ormsby, press secretary for Boston Mayor Martin J. Walsh, in an e-mail. Temperatures were expected to hover around zero with windchills as low as minus-18. Tuesday will be sunny, with temperatures climbing into the low 20s in Boston. But continued wind will make it feel like minus-14. Tuesday night’s low is expected to be around 16. Forecasters are expecting temperatures to climb during the week, with Wednesday reaching 43. Thursday could see a high of 50 degrees. Correspondent Sophia Eppolito contributed to this report. Aimee Ortiz can be reached at aimee.ortiz@globe.com. Follow her on twitter @aimee_ortiz.